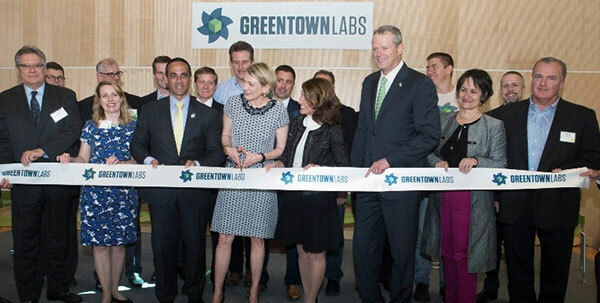 Earlier this month, I was honored to attend the grand opening of Greentown Labs’ Global Center for Cleantech Innovation. 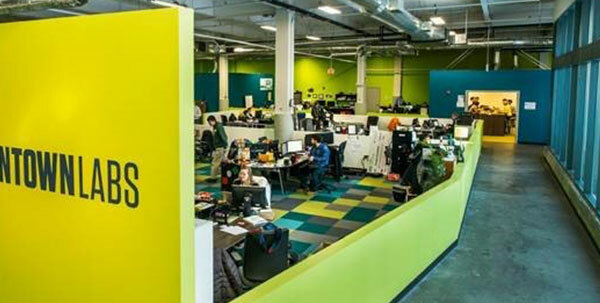 Since 2014, our parent company, Saint-Gobain, has supported Greentown Labs, the largest clean technology incubator in the United States, by providing building science expertise and building products from our family of companies to help renovate the historic building that is now home to 80 cleantech startup companies. As a founding sponsor of the new Center, Saint-Gobain was the first and largest example of a corporation using the expansion facility as a test site for our products and materials. Because of our innovative mindset, SageGlass wanted to get involved in this partnership right away. We installed more than 800 square feet of our dynamic glass on the third floor of the Center to help the building achieve its sustainability goals while creating a workplace that optimizes employee well-being by maintaining outdoor views and preventing heat gain and glare. We are also using the Center as an opportunity to study the impact of our dynamic glass on overall occupant productivity and well-being. Feedback from Greentown Labs members will allow building scientists to measure the impact SageGlass has on occupant comfort. Greentown Labs members will use the CrowdComfort app – a startup developed through Greentown Labs – to report their feedback and input. The data collected and subsequent analysis will directly impact future product and business development. Along with contributing building materials and expertise, Saint-Gobain employees will also have the opportunity to utilize Greentown Labs as a learning space where we can collaborate with the smartest minds both inside and outside of Saint-Gobain, who share our passion for developing sustainable building materials and creating a brighter future. By working together with like-minded partners, we hope to spur innovative sustainable growth. The grand opening was an exciting day, not just because of the product development initiatives underway, but also because of the buzzing excitement surrounding cleantech innovation. Hundreds of people, including the Governor of Massachusetts, were on-site to learn more about reducing negative environmental impacts. This means that people are not completely satisfied with the cleantech offerings available today and are in strong support of how this Center will spur the development of energy-efficient technologies.